What are the symptoms experienced when a person feels dizzy? When should I call the doctor for dizziness? Dizziness is a symptom that often applies to a variety of sensations including lightheadedness and vertigo. Vertigo is the sensation of spinning, while lightheadedness is typically described as near fainting, and weakness. Some of the conditions that may cause lightheadedness in a patient include low blood pressure, high blood pressure, dehydration, medications, postural or orthostatic hypotension, diabetes, endocrine disorders, hyperventilation, heart conditions, and vasovagal syncope. Vertigo is most often caused by a problem in the balance centers of the inner ear called the vestibular system and causes the sensation of the room spinning. It may be associated with vomiting. Symptoms often are made worse with position changes. Those with significant symptoms and vomiting may need intravenous medication and hospitalization. Vertigo is also the presenting symptom in patients with Meniere's Disease and acoustic neuroma, conditions that often require referral to an ENT specialist. Vertigo may also be a symptom of stroke. Most often, dizziness or lightheadedness is a temporary situation that resolves spontaneously without a specific diagnosis being made. Dizziness is one of the most common symptoms that will prompt a person to seek medical care. The term dizziness is sometimes difficult to understand since it means different things to different people. It is either the sensation of feeling lightheaded as if the individual is weak and will pass out, or it describes vertigo or the sensation of spinning, as if the affected person just got off a merry-go-round. Lightheadedness is often caused by a decrease in blood supply to the brain, while vertigo may be caused by disturbances of the inner ear and the balance centers of the brain. It is important that the health care provider understand the complaint the person is experiencing. That is the first important step so that the proper direction can be taken to find a diagnosis and begin treatment. Dizziness is a painless head discomfort with many possible causes including disturbances of vision, the brain, balance (vestibular) system of the inner ear, and gastrointestinal system. Dizziness is a medically indistinct term which laypersons use to describe a variety of conditions such as lightheadedness, unsteadiness, and vertigo. While classifying dizziness into lightheadedness and vertigo categories may help understand how the body works, sometimes it is worthwhile to review common reasons why people might complain of dizziness. Dizziness, lightheadedness, and the feeling of passing out is a common complaint in people who have low blood pressure. When the blood pressure is too low, not enough oxygen-rich blood is being delivered to the brain, and its function can be affected. If the brain's blood supply is decreased too much, the person may pass out (syncope). Symptoms may worsen when changing position from lying down or sitting, to standing up. Dehydration (loss of water in the body) often occurs with infections that cause vomiting and diarrhea. Fever also can cause a significant amount of water loss due to increased metabolic rate and excessive sweating as the body tries to cool itself. Heat-related illnesses associated with dehydration such as heat cramps, heat exhaustion, or heat stroke (a medical emergency). beta blockers (propranolol [Inderal, Inderal LA], atenolol [Tenormin], metoprolol, [Lopressor, Toprol XL]), which block adrenalin receptors in the heart and may limit the ability of the heart rate to increase in response to changes of position, decreased red blood cell count, or dehydration. Nitroglycerin and isosorbide mononitrate (Imdur), a long acting nitroglycerin, are medications that are prescribed to dilate blood vessels in the heart to treat angina. However, these medications also cause other blood vessels in the body to dilate, decreasing blood pressure. Medications for erectile dysfunction (sildenafil [Viagra, Revatio], tadalafil [Cialis], and vardenafil [Levitra, Staxyn ODT], avanafil [Stendra]) that can dilate blood vessels. In individuals who are dehydrated or anemic, blood pressure readings may be normal when they are lying flat; however, the lack of fluid is unmasked when they stand up quickly. The lack of blood to the brain may cause dizziness and lightheadedness. This feeling may pass in a few seconds as the body adapts. However, if dehydration or medications (for example, beta blockers) prevent the body from reacting by constricting blood vessels and increasing the heart rate, the dizziness may persist to the point at which the patient passes out (faints, or experiences syncope). Some diseases are associated with an inability to compensate for changes in body position (autonomic dysfunction). Normally when a person stands, blood vessels contract to increase blood pressure slightly, and the heart rate increases to pump blood uphill to the brain against gravity. In autonomic dysfunction, a person may become dizzy when they move from a lying position to sitting or standing up. Examples of these diseases include diabetes, Addison's disease, or Parkinson's disease). Orthostatic hypotension is a common symptom with Shy-Drager syndrome. Shy-Drager syndrome is a rare disease in which the autonomic nervous system degenerates and cannot provide the routine control mechanisms for the body including heart rate, blood pressure, and bowel and bladder function. High blood pressure, or hypertension, is known as the "silent killer" since it often has no symptoms, even if blood pressure readings are markedly elevated. On occasion, a person may complain of headache, nausea, or dizziness, although the complaints don't necessarily correlate with the degree of blood pressure elevation. However, if the blood pressure is elevated and the person has symptoms, there is a need to bring the blood pressure under control relatively quickly. The more severe the symptoms, the quicker blood pressure control needs to be achieved. For example, if a person is having chest pain or stroke symptoms associated with high blood pressure, the blood pressure needs to be controlled immediately (hypertensive emergency). Dizziness is a common complaint in persons with diabetes, and may be caused by low blood sugar (hypoglycemia), high blood sugar (hyperglycemia), or autonomic dysfunction (see previous section). Hypoglycemia or low blood sugar (hypo=low +glyc=sugar =emia=blood) describes an inadequate amount of glucose concentration in the blood. A person with diabetes can develop hypoglycemia from a decrease of food intake, or from taking too much medication (insulin or oral tablets), which results in low blood sugar levels. In this situation the person experiences dizziness or lightheadedness because the brain lacks glucose to function properly. Individuals with diabetes and their families need to recognize the symptoms of hypoglycemia, including dizziness, sweating, confusion, and potentially, coma. Immediate treatment is necessary. Sugar-containing foods given by mouth if the person is awake, or a glucagon injection may be life-saving for the patient. Hyperglycemia (hyper=high +glyc=sugar +emia=blood) also may cause dizziness due to dehydration. High blood sugar levels occur because there is not enough insulin available to allow cells to use glucose for energy metabolism. (Interestingly, brain cells do not need insulin to use glucose.) High blood sugars cause a variety of metabolic responses in the body leading to dehydration, anaerobic metabolism, and changes in the acid-base balance. This may result in a life-threatening condition including diabetic ketoacidosis and nonketotic diabetic acidosis. Diabetes (discussed previously) if not well controlled is one of the main endocrine diseases that may cause dizziness. Thyroid disease: Abnormalities of the thyroid may also cause dizziness as a symptom. Hyperthyroidism (too much thyroid hormone) may cause palpitations, shortness of breath, and lightheadedness. Hypothyroidism (too little thyroid hormone) may cause low blood pressure and a decreased heart rate leading to lightheadedness, weakness, lethargy, and chills. Addison's disease: Addison's disease occurs when the adrenal glands do not produce enough cortisol to meet the needs of the body. Cortisol is a naturally occurring steroid produced by the body and is part of the stress response (often termed the "fight or flight" response). If cortisol levels are low, a patient may experience weakness, fatigue, lightheadedness, low blood sugar, and low blood pressure. While the body may use hyperventilation or rapid breathing to help with acid-base balance, it may also occur as a response to an emotionally stressful situation. In hyperventilation syndrome, the rapid breathing eliminates some of the body's carbon dioxide, leading to a tingling sensation in the hands and feet, and around the mouth. Dizziness and lightheadedness are associated symptoms. The symptoms may increase the perceived emotional stress and cause even more hyperventilation. In severe hyperventilation, carbon dioxide levels drop enough to cause carpopedal spasm, in which the hands and feet become claw-like and difficult to move. Symptoms of hyperventilation resolve relatively quickly once the breathing rate returns to normal. Hyperventilation is not always an emotional response. People with asthma, exacerbations of COPD, congestive heart failure, and pneumonia also may breathe quickly to help maintain oxygen levels in the bloodstream. Hyperventilation is also present whenever the body becomes acidotic; the rapid breathing is one correction method that the body uses to regulate its acid-base balance. The heart is an electrical pump and for it to work, the electrical conduction system must be operating properly to stimulate the heart muscle to squeeze in a coordinated fashion and pump blood to the body. The heart muscle itself must be strong enough to pump blood, and the valves in the heart must work properly to allow blood to flow in the direction intended during contraction. Conduction disturbances: Electrical conduction disturbances may make the heart beat too quickly (tachycardia) or too slowly (bradycardia), and either of these situations may result in an inadequate blood supply to the brain, causing dizziness or lightheadedness. Cardiomyopathy: Dizziness is also a symptom of cardiomyopathy (cardio=heart +myo=muscle + pathy= disease), a disease of the heart muscle, resulting in muscle that doesn't squeeze effectively. Most commonly the weakness is due to atherosclerotic heart disease or ischemic cardiomyopathy (ischemic=decreased blood supply), in which the heart muscle itself doesn't get enough blood supply to work properly. Other non-ischemic cardiomyopathies may be due to diabetes, alcohol use, and viral infections. Vasovagal syncope is a common cause of dizziness, lightheadedness, and fainting. The vagus nerve is overstimulated and causes the body's blood vessels to dilate and the heart to slow down. This anti-adrenaline effect decreases the ability of the heart to pump blood upward toward the brain. Without blood flow, the brain turns off. In Victorian England, young ladies' sensibilities were easily offended causing a vasovagal episode called a swoon. Some people faint at the sight of blood. Some parents faint when their child gets immunized. Some medical students faint at their first autopsy. Many types of emotional and physical stressors can overstimulate the vagus nerve, causing dizziness, lightheadedness, and at times fainting (passing out). Fainting is not normal. If a person is unconscious, the emergency medical system should be activated (call 911 if available), and medical care should be sought. Vertigo is often described as feeling dizzy, or as a sensation of spinning. A person may specifically mention that the room seems to be spinning around them. Sometimes the complaint is loss of balance or loss of equilibrium. This often occurs because of irritation in the inner ear (the part of the ear that involves balance, not hearing). The inner ear has two parts that help the body determine its position in space relative to gravity; 1) the semicircular canals and 2) the vestibule. There are three semicircular canals that are aligned at right angles to each other. These canals are filled with fluid and are lined with a nerve-filled, crystal-encrusted membrane that transmits information to the cerebellum (the part of the brain that controls balance and coordination). The cerebellum collects information from the eyes (visual stimuli) and the nerve endings in muscles associated with proprioception (the perception of movement), to assist the brain in assessing where the body is in relationship to gravity every time one part of it moves. Normally, when the head moves, fluid in the semicircular canals shifts, and that information is relayed to the brain. When the head stops moving, the fluid stops as well, and that information is relayed to the brain. In some cases there may be a short delay in the transmission of this information to the brain. For example, when a person rides on a merry-go-round or spins quickly around in circles, the fluid in the canals develop momentum and though the body stops spinning, the fluid in the semicircular canals may continue to move. This causes vertigo, or a sensation of spinning, and may cause the person to fall or stumble. It also may be associated with vomiting. While kids try to provoke these are symptoms in play, they can be debilitating for an adult. Inflammation: In patients with vertigo, inflammation of the fluid or irritation of the crystals on the membrane that lines the walls of the semicircular canals may cause the spinning sensation even without much head movement. Often, only one canal is involved and the patient may be symptom-free if they don't move. Benign paroxysmal positional vertigo (BPPV): BPPV may be caused when the crystals in the inner ear become dislodged and irritate the semicircular canals. Often the cause is not found, but there may be an association with unusual positioning or movement of the head. Examples include moving the head up and down while working on a computer, or dusting something above the level of the head. It is frequently seen in people older than 60 years of age. Labyrinthitis: Labyrinthitis (labyrinth=inner ear + itis=inflammation) may follow a viral infection which causes inflammation within the middle ear. Meniere's disease: This condition is a disorder of the flow of fluids of the inner ear. Three symptoms usually found together are vertigo, hearing loss, and tinnitus (ringing in the ears). 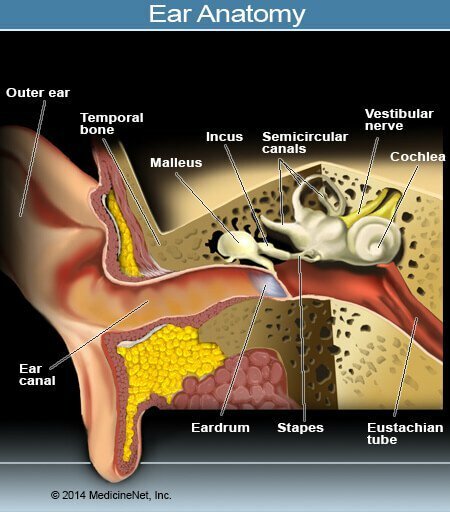 Acoustic neuroma: This is a benign tumor of the ear that can be present with vertigo. Neurologic: Much less commonly, the cause of vertigo may arise from the brain. Stroke, tumors, seizures and multiple sclerosis may be associated with vertigo. Trauma: Vertigo may be a symptom of concussion and minor head trauma. Lightheadedness is the feeling of weakness and faintness as if you are about to pass out. The symptoms tend to be short-lived, depending on the cause. There may be associated nausea, sweating, and blurred vision. Heart rhythm disturbances may occur without warning and may be associated with palpitations. This may come and go or it may persist. The heart beat may be felt as too fast (often described as a pounding or fluttering), too slow, and/or irregular. Vertigo is the sensation of spinning and may present without warning and be associated with nausea and vomiting. People with inner ear problems may be debilitated and unable to move without generating symptoms. People with a cerebellar cause of vertigo such as a stroke or tumor may have associated coordination problems or difficulty walking. Chest pain, shortness of breath, or palpitations. These symptoms should not be ignored as they suggest the heart may be the source of the dizziness. Dehydration. Often there may be an associated illness including fever, vomiting, or diarrhea. People with diabetes may have dizziness due to low blood sugar (hypoglycemia) or high blood sugar (hyperglycemia), and may need emergent care to stabilize their insulin and medication requirements. Altered mental status or thinking. This may include symptoms such as confusion, change in vision, change in speech, facial droop, weakness of one side of the body, or headache. These may be signs of stroke, bleeding in the brain, or tumor. Vertigo may cause significant problems with vomiting and may be debilitating. Often, medical care is needed to control symptoms even though the underlying problem is not necessarily serious. The diagnosis of dizziness begins with the health care professional deciding whether the complaint of dizziness refers to lightheadedness or vertigo. Further diagnosis continues once this distinction is made. The key to the diagnosis of dizziness is a thorough history and physical examination. Often the diagnosis is made by listening to the patient's story. The health care professional may ask about triggers that cause and relieve the symptoms of dizziness. "Is it related to changing positions quickly?" "Does it resolve on its own or does the patient have to do something, like lie down to make it better?" "Does turning the head bring on the symptoms? Do the symptoms resolve when the patient is very still?" "Is there associated hearing loss or ringing in the ears?" A review of systems is a series of questions that review the patient's body functions. Questions may be asked about associated symptoms including fever, vomiting, diarrhea, chest pain, shortness of breath, palpitations, or abnormal bleeding. The past medical history may be reviewed, and this includes reviewing medications the patient is currently taking. Vital signs: Taking the patient's blood pressure and pulse rate lying down and standing (called orthostatic or postural vital signs) often will indicate the fluid status of the body. In patients who are dehydrated or bleeding, the blood pressure may fall and pulse rate may rise on changing position. However, patients taking medications like beta blockers will not generate an increased pulse rate. Tailored physical examination: Often, the physical examination is tailored to the patient based upon the information provided in the patient's medical history. For example, a woman with a heavy menstrual period may need a pelvic examination, or a patient with cough and shortness of breath may need a closer examination of the heart and lungs. A patient thought to have vertigo will have closer focus on the neurologic exam, including the cerebellum, the portion of the brain responsible for balance and coordination. X-rays, CT scans, and MRI may be indicated depending upon the patient's needs. The diagnosis of vertigo is most often made based upon history and clinical presentation. If the patient is experiencing a spinning sensation that worsens by a change in position, and lessens by lying still, the health care professional can confirm the cause of dizziness as vertigo if there are appropriate findings on physical examination. Further history may be taken to make certain that the symptom of vertigo is isolated to an inner ear condition and not due to a problem in the brain (for example, a stroke). Physical examination will focus on the neurologic examination and may involve looking at eye movements. With vertigo, nystagmus may be present. This is an involuntary movement of the eyes, slow and smooth in one direction with fast twitches in the other. It is the eyes' attempt to compensate for the abnormal signals being created in the inner ear. The patient may be asked to lay flat or sit upright to uncover the presence of nystagmus. The patient's hearing may be tested to assess potential hearing loss. This may be seen in Meniere's disease or with an acoustic neuroma, but not necessarily with labyrinthitis or benign positional vertigo. The rest of the neurologic examination may be done to look for one-sided weakness, loss of coordination, or loss of balance as potential signs of stroke. Evaluation for BPPV or labyrinthitis is often complete at this point, although depending upon the health care professional's concerns, further testing may be indicated. Referral may be made to a physical therapist specially trained in vestibular therapy for diagnosis confirmation and symptom relief. If there is confusion as to the potential cause of vertigo, imaging of the brain may be needed. Magnetic resonance imaging (MRI) may be indicated since this test evaluates the cerebellum more accurately. Computerized tomography (CT scan) may be used in an emergency to look for bleeding in the brain. Dizziness is a symptom, not a disease, and treatment will be directed to the underlying cause. For example, dizziness or lightheadedness due to dehydration from gastroenteritis may require intravenous fluids and medications to stop the vomiting and diarrhea, while dizziness or lightheadedness from a heart rhythm condition may require admission to the hospital and specialized testing and treatment. Vertigo from inner ear problems may often be treated with maneuvers to reposition the crystals and debris in the semicircular canals. Repositioning techniques that can be helpful include the so-called Epley and Semont maneuvers, and the patient may be taught these to use at home. Depending upon the reason for the inner ear inflammation, oral steroid medications to decrease that inflammation might be prescribed. Over-the-counter or prescription medication is occasionally recommended or prescribed to help with vertigo. Meclizine (Antivert) or diazepam (Valium) may help with control of mild symptoms. In patients with intractable symptoms and vomiting, intravenous diazepam (Valium) may be considered. Patients with Meniere's disease or acoustic neuroma are usually referred to an ear, nose, and throat specialist (otolaryngologist, ENT physician) for further evaluation and care. 11. The Yorck Project: 10.000 Meisterwerke der Malerei. DVD-ROM, 2002. ISBN 3936122202. Distributed by DIRECTMEDIA Publishing GmbH. Please describe your diagnosis of your dizziness. 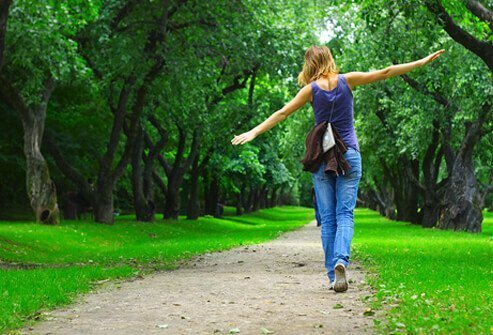 Please describe your experience with dizziness when standing up. What was the treatment for your dizziness? Read about early signs and symptoms of pregnancy such as nausea and vomiting (morning sickness), bloating, tender breasts, and more. Explore first trimester symptoms. Do you know what heat rash looks like? Heat rash (also called prickly heat) develops when the skin sweat ducts become blocked. Red bumps, discomfort, and itching are common heat rash symptoms. Multiple sclerosis (MS) symptoms vary from person to person, and can last for days to months without periods of remission. Symptoms of MS include sexual problems and problems with the bowel, bladder, eyes, muscles, speech, swallowing, brain, and nervous system. The early symptoms and signs of multiple sclerosis usually start between age 20 and 40. MS in children, teens, and those over age 40 is rare. Treatment options for multiple sclerosis vary depending on the type and severity of symptoms. Medications may be prescribed to manage MS symptoms.